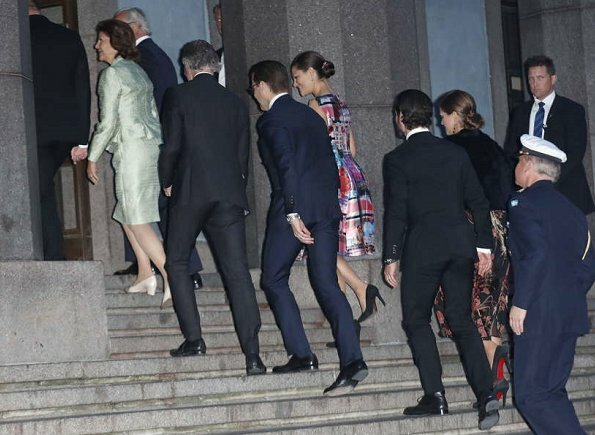 In the evening of September 12, King Carl Gustaf, Queen Silvia, Crown Princess Victoria, Prince Daniel, Prince Carl Philip and Princess Madeleine of Sweden attended a concert at Stockholm Concert Hall in connection with the Opening of the Parliamentary Session. The concert was conducted by Katarina Andreasson. I think Victoria is expecting. She has gained some weight and she is usually very fit. Queen Silvia's suit is very becoming to her, an excellent color for her, with cute details of pleats, around the buttons and sleeve caps. 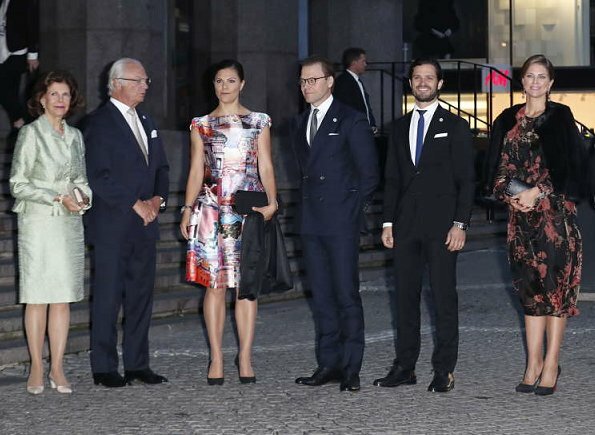 Crown Princess Victoria's dress is 'interesting' but not particularly attractive with that shiny print. The seams on that front panel do make it look like she has something 'extra' in front. In recent pictures she wears long overblouses a lot. And Princess Madeleine's dress would look better a few inches shorter. It looks a bit matronly, but then right now she IS matronly! Yes, Madeleines dress would look better a few inches shorter, but with her style and with her smile she is the 'winner' here. I would not be surprised if Victoria announced that she's pregnant. Silvia: Nice becoming color to her. Victoria: Best she has had in these digital print dresses, she looks radiant. Madeline: Too matronly and gives nothing to her. All royal ladies look very lovely, each of them in their own way and style. Victorias dress is a bit young for her, and Madeleines way too old for her! Silvias outfit is spot on, agewise! I m h o. And they all look stunning nevertheless. Victoria seems to like dresses with big shiny prints on them, too youthful for her. Madeleine 's dress doesn't do much for her, too frumpy. i think victoria isnt pregnant but she has gained some weight. Victoria's figure does seem to have altered, it would be wonderful if she was expecting another child, although any weight gain could be hormonal now that she is in her forties (all that fun could start any time now).